Grace of India - Autumn Menu uses their own specialised couriers to deliver their food. Spinach, coriander, mint and North Indian spices shallow fried. Chicken drumsticks marinated in cornflour and served with curry leaves, shallots and cumin. Black gram lentil cooked in Mughal spices, garlic and ginger. Chicken cooked in tomato and cashews - mild and creamy. Soft roll with cinnamon, vanilla and honey. Kheema samosa, chicken tikka, seekh kebab. Goan coconut prawns, fish tikka, seasonal seafood special. Homemade pastry filled with Lamb mince, potatoes and peas, infused with traditional herbs and spices plus served with mint sauce. 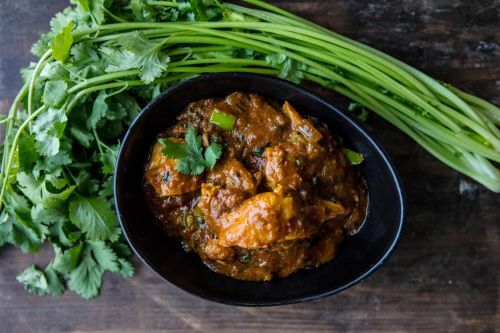 Chicken thigh marinated in a Punjabi style mint sauce slow cooked in the tandoor, served with fresh coriander and lime juice plus served with mint sauce. Minced lamb pressed on a skewer and smoke roasted over charcoal plus served with mint sauce. Goat slow cooked on a hot plate mixed with select ground spices. Masala marinated lamb chops cooked in tandoor plus served with mint sauce. Tempered with mustard seeds and curry leaves finished with a touch of coconut, toasted spices and tamarind. Fish marinated in our homemade ground mix and cooked in our clay oven. Chickpea batter and spice infused in yoghurt sauce and lightly fried. Vegetable samosa, aloo tikki, onion bhaji plus served with beetroot sauce. Homemade pastry filled with potatoes and peas, infused with traditional herbs and spices plus served with beetroot sauce. Spiced potato stuffed with cottage cheese, ginger, cumin and coriander powder plus served with beetroot sauce. Onion fritters made in a chickpea batter with fresh ginger and garlic plus served with beetroot sauce. Cottage cheese marinated in aachari (pickle) sauce and cooked in the tandoor plus served with beetroot sauce. Fresh mushrooms, capsicum and onions served in a tangy sweet chilli and soy sauce. One of Singh’s fusion dishes. A sweet and sour dish. Our homemade tamarind sauce with dice cut pieces of tandoori chicken. Coconut curry with Kashmiri herbs and red wine. Fresh lime juice, king prawns, capsicum and butter with a tomato base topped with pan fried coriander seeds and spring coriander. Smooth and tasty slow cooked goat curry made with home-churned pure ghee and aromatic spices, originally created for the royal Moghuls in the Northern Indian provinces. Cottage cheese cooked in a wok with fresh green herbs spices, tomatoes and capsicum and then mixed with a spicy tomato base. Tandoori lamb cutlets served in an Indian style fresh tomato gravy with garam masala, topped with fresh coriander. Marinated tandoori lamb cutlets cooked with curry leaves and coconut cream. Slow cooked goat served in a spinach, fenugreek, onion, ginger and turmeric paste. A delicious curry base gravy with aromatic herbs and spices. Traditionally spicy curry from Goa cooked in onions, cumin, ginger and chilies with a distinct flavor of vinegar and hot spices. A medium dish cooked with tomatoes, onions and mixed vegetables, finished with lemon juice. Yoghurt based dish cooked with almond sauce, cashew and cream. A classic Kashmiri dish cooked with a rich gravy of tomatoes and Kashmiri spices. South Indian style curry made using coconut milk & cream, mustard seeds, curry leaves and chilli. Your selection cooked in spinach and spices. Rice cooked with spices and meat of your choice. Smoked and marinated chicken fillet in a creamy tomato base. Chicken tikka pieces cooked the traditional way in the tandoor, sautéed with onions, capsicums and imported spices. Chicken thigh in our masala sauce cooked with our secret garlic granule recipe plus fresh lemon. Chicken fillet pieces in a creamy mild mango sauce. Minced lamb kebab cooked in a medium spicy coconut base. Beef curry cooked with cardamom, cinnamon, fennel and cumin seeds. Boiled lentils slow cooked together with our ‘tadka’ (Punjabi base). Cottage cheese in a curry base along with fresh peas and spices. Potato, green peas and tomato. One of the most popular dishes in Kashmir. Cottage cheese, bread crumb and potato dumplings in a cashew sauce. Sautéed in butter, fresh green leafy spinach blended with exotic Indian masala and home made cottage cheese pieces. Tender cheese pieces cooked in a mouth watering medium creamy cashew sauce, garnished with almonds and cream. Choice of mango chutney, chilli pickle and lime pickle. Cucumber raita, tomato onion, mango chutney and lime pickle. Rice cooked with toasted cumin and masala. Divine rice cooked in saffron, orange peel and almonds. Fine plain flour bread cooked in the tandoor. Tandoori bread made with garlic and coriander. Bread stuffed with butter plus sesame seeds. Soft multi-layered wholemeal bread prepared with butter. Naan stuffed with nuts and raisins. Naan stuffed with garlic and cheese plus coriander. Naan stuffed with garlic, cheese. coriander and chilli. Naan stuffed with spiced mince. Naan stuffed with spiced vegetables. Chicken marinated in spices, ginger, garlic extract, lemon juice, yoghurt and smoke roasted. Assortment of lamb cutlet + tandoori chicken + chicken tikka + seekh kebab. Indian ice cream made from sweetened condensed milk, dry nuts and mango pulp. Milk cakes served in pistachio & cardamom. Naan bread stuffed with Nutella and nuts gala.